We woke up for breakfast, then went to our morning excursion to James Bay . 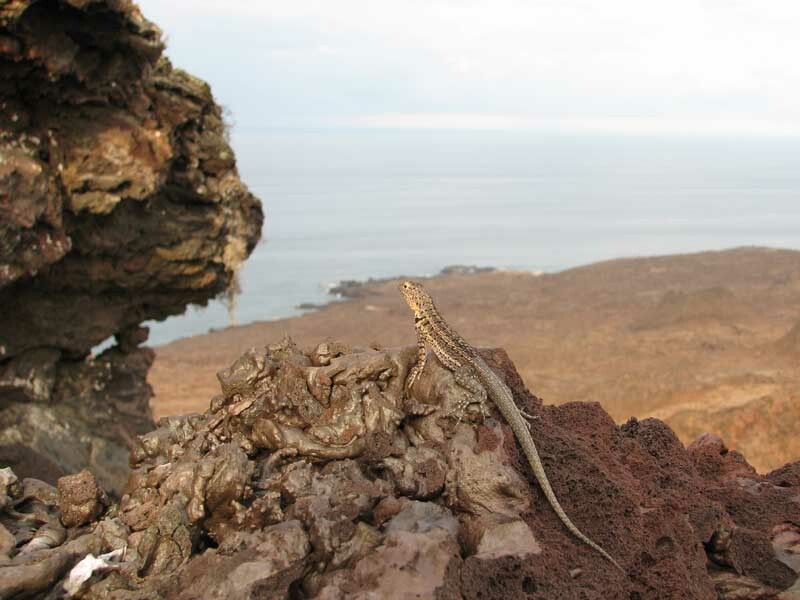 Several of the groups started walking along the coast, so we walked a little inland through some scrub (some Acacia Macranthus and other small shrubby trees), then came back along the coast. We walked behind the others in our group – each group has 10-12 people and a naturalist guide – so that we could try to listen for animals without the chatter. 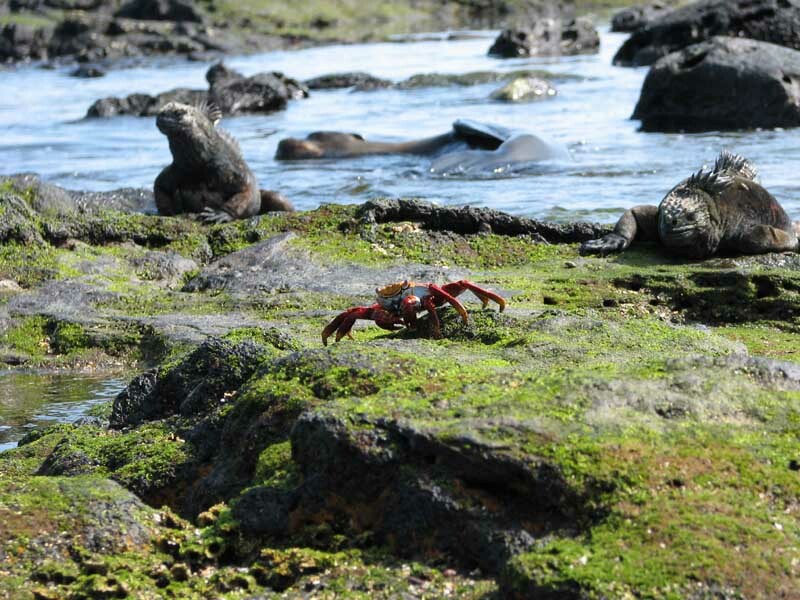 Because of this, we actually saw some things that everyone else missed, including a huge Galapagos Hawk. 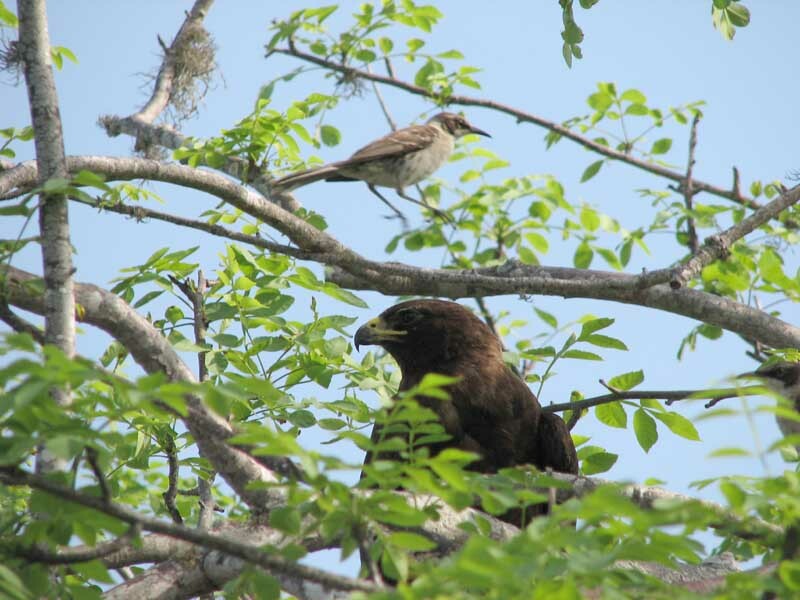 We snagged a picture that also had a Galapagos mockingbird. We had no idea what we had taken a picture of, so we asked the guide, and he was very impressed that we were able to photograph both of them, especially in the same shot. Most of what we saw was along the coast. 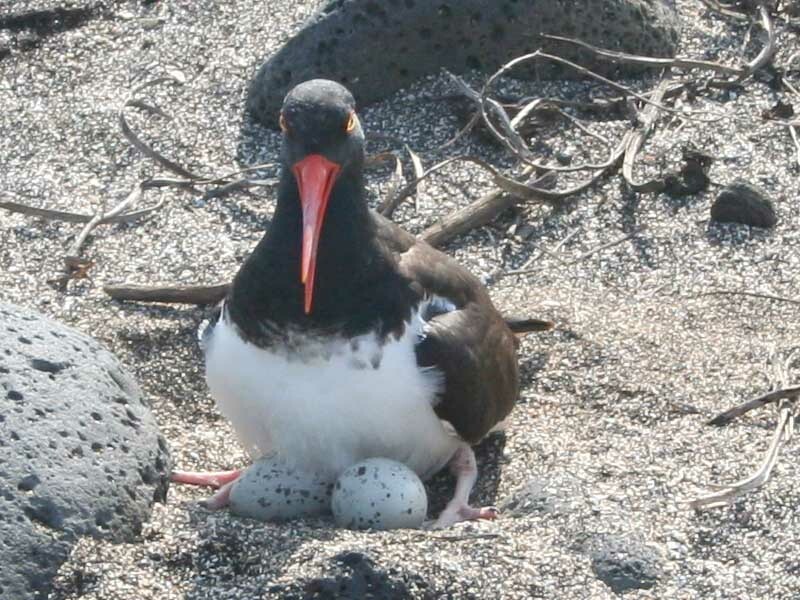 There were thousands of the Lightfoot crabs, hundreds of marine iguanas, plus some Galapagos Sea Lions, Galapagos Fur Seals (which are actually sea lions, not seals), an American Oystercatcher with its eggs – Photo courtesy of Tom Evans, a few Lava Herons, Galapagos Doves, and Lava Lizards. Although all the television shows indicate that you can walk right up to the animals, it was still weird to actually do it in person. 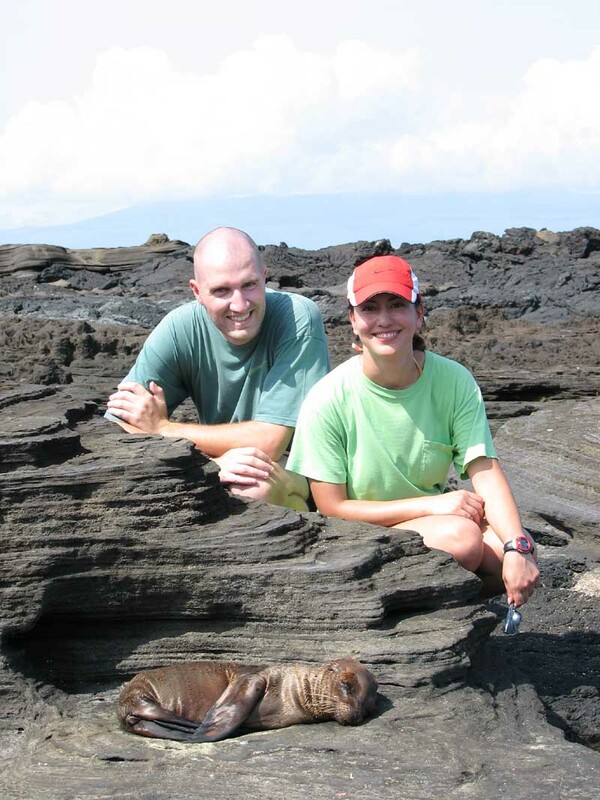 There was even a baby sea lion, no more than 2 weeks old, that we were able to walk right up to and have our picture taken with. We don't think he ever even woke up. We walked back to the place where our boat had landed, and went snorkeling. Justin stayed closer to the beach, and saw a sea lion, some fish, and a penguin. Crystal went out farther and saw white-tipped reef sharks (maybe 4 feet long), a stingray, a turtle, several fish (including a parrot fish and some trigger fish), plus 4-5 sea lions, including some that swam up close to her. 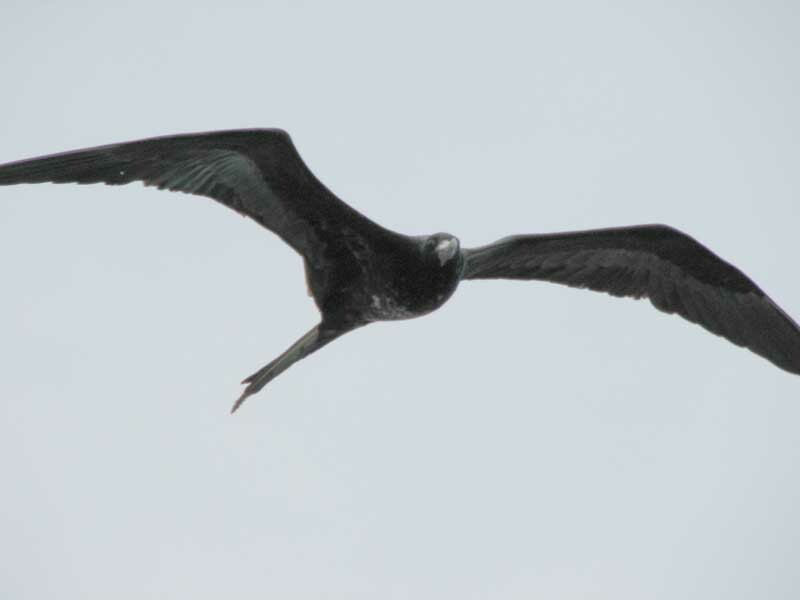 Back aboard the eclipse, we were waiting around for lunch on the deck, and we noticed there was a Frigate bird flying right along with us, going more or less the same speed as the boat. Because of this, taking a picture was more or less like taking a still photo. Our afternoon excursion was split in half. The first half was snorkeling. When we left the boat, it was just starting to rain. By the time we started snorkeling, it was raining so hard that we could barely see in front of us. Crystal was out in deeper water, and saw some parrot fish, yellow-tailed surgeon fish, some more sea lions, and some penguins (which were on land, not in the water). Justin was in shallower water, and waded around a coral reef near the shore. He saw an angelfish, parrot fish, a bunch of yellow-tailed grunts, and some other stuff he had no idea what it was. Crystal 's group had to swim back to shore from the deeper water, and several of the people in the group complained about the "long" swim – it was about 150 meters (3 full laps in a pool). The second half of the excursion was a hike to the highest point on Bartolome island, for a view of Bartolome and several surrounding islands. Several people were apparently allergic to exercise, and didn't want to walk up the hill, so they just went on a panga ride around the island instead. The guide challenged us to count the steps, so Justin did, and actually got it right on the nose – 367. That being said, it was only about 20 minutes to get to the top. 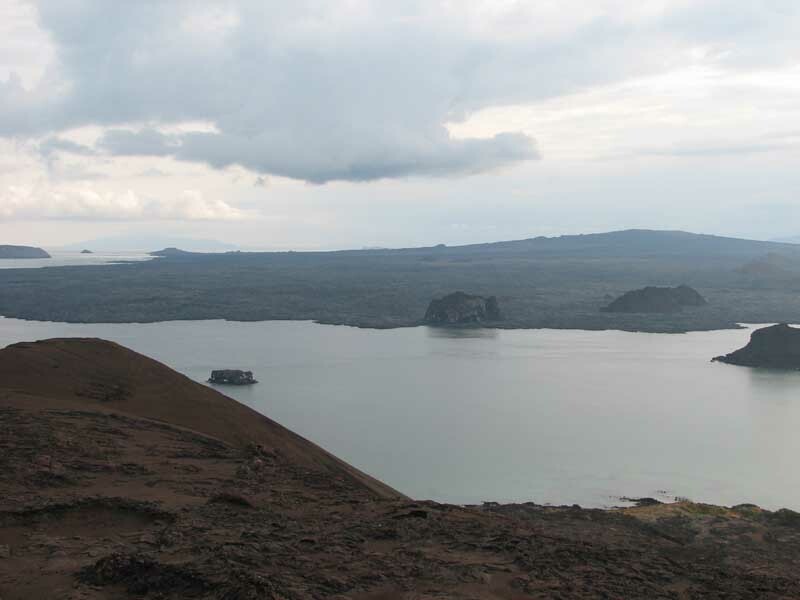 The scenery was a bunch of lava, since Bartolome is a relatively young volcanic island that receives almost no water to slowly change the lava into soil. 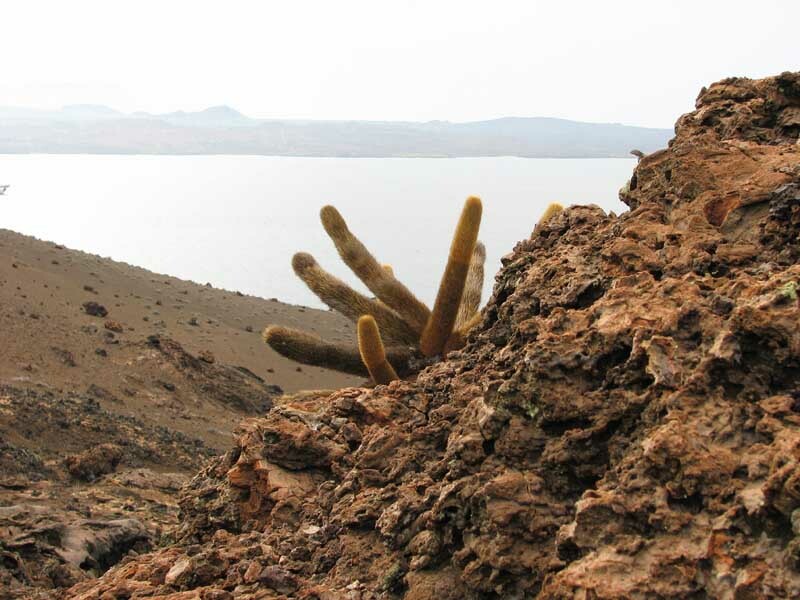 There were a few pioneer plants, though, some Tiquila and some lava cacti. From the top you could see two beaches nearly side by side on Bartolome – one on each side of the island. A submerged cinder cone was also noticeable from the top. From the top, the beach did not at all resemble the beach we had been snorkeling at a few hours earlier. The rain was gone, the beach was actually visible, and everything looked much nicer. Our guide, Giovanni, told us about a worldwide treasure hunt sponsored by Glenfiddich Whiskey back in the 1970s. The company had stored some of its best alcohol somewhere in the world, and slowly gave out random clues over time. Some of these clues were things like "penguins," "silhouette of a woman," "volcanoes," "Chinaman's hat," and other things that basically made no sense when put together. 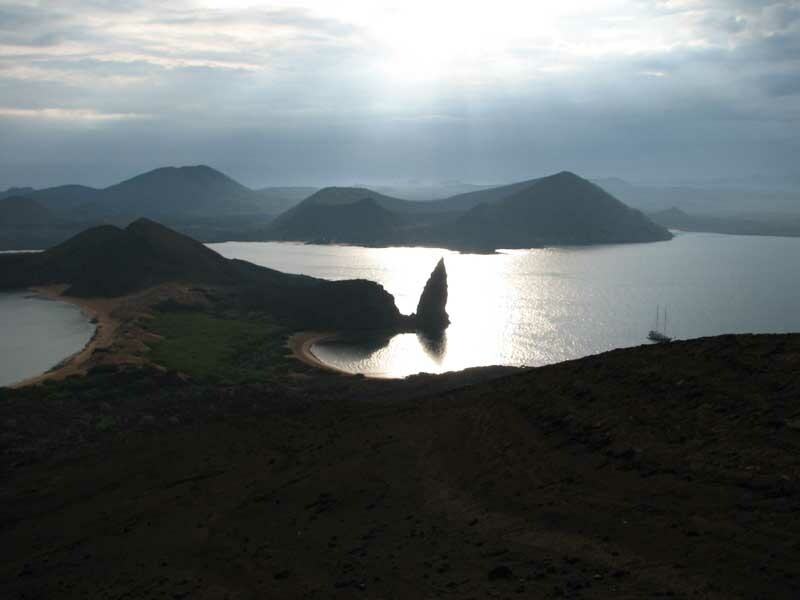 One of the people who had been on another of Giovanni's boats many years ago realized one day that the treasure must be in the Galapagos, because one of the islands noticeable from Bartolome looks like a Chinaman's hat. 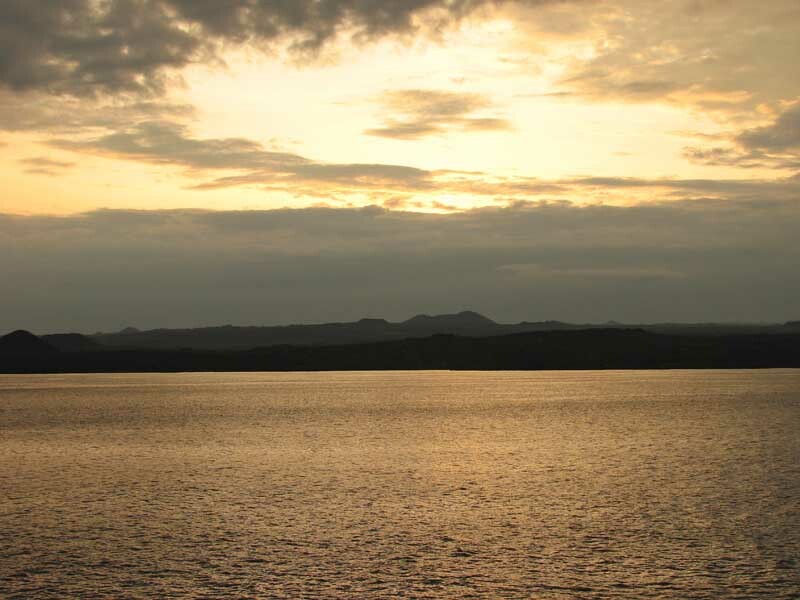 The person went looking around that island for hours, finding nothing, when he noticed that a nearby island looked exactly like a silhouette of a woman. 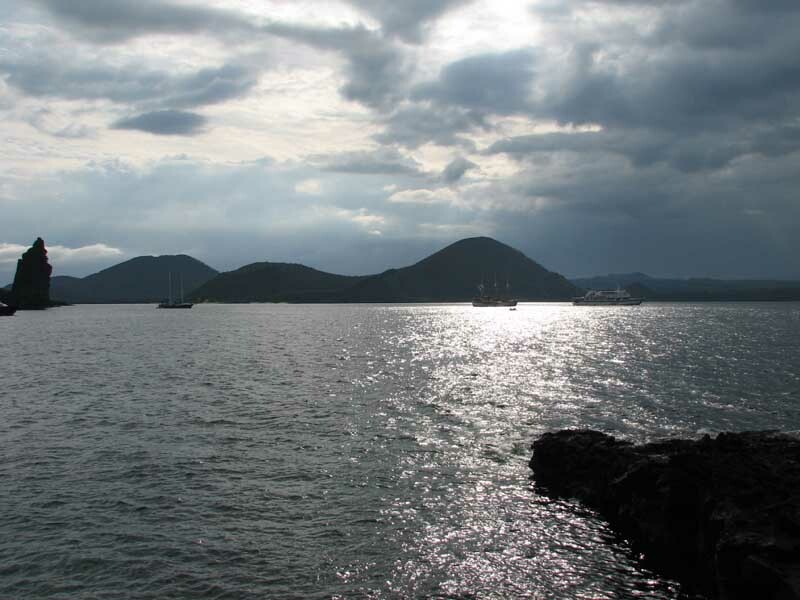 The person and his group found a cave on that island, ran in, and found…a note saying "Beat you, 1978" and the names of the people who found the treasure in 1978. We got back and were relaxing in the cabin when over the intercom we were told that there were some bottle-nosed dolphins off the front of the boat. We grabbed our cameras and went out, hoping to see them. 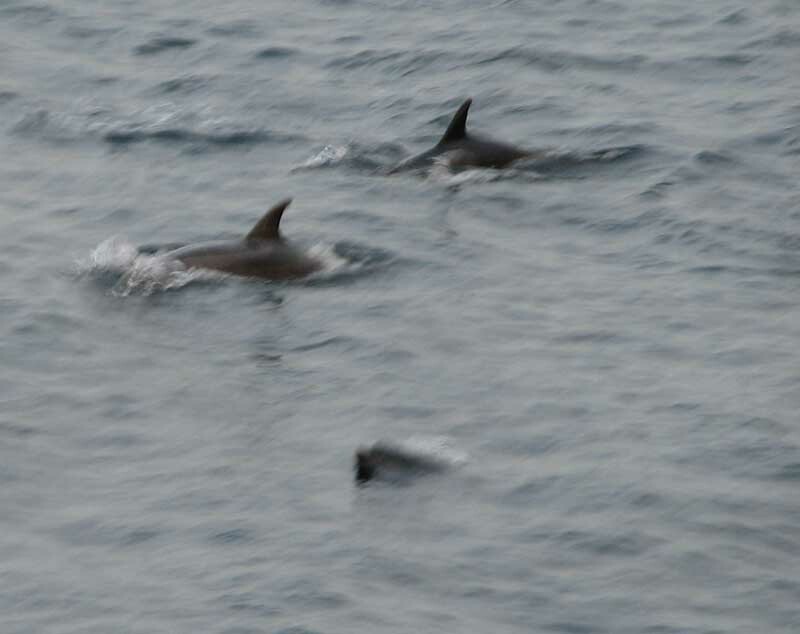 As it turned out, there was a large pod of over 300 dolphins in front, with some stragglers on the side of the boat, some doing tricks like jumping out of the water and splashing back in, some slapping their tails – it was amazing. To make it better, however, one of the crew discretely told us that there was a panga that was about to take people out closer to the dolphins. That panga had trouble being lifted back onto the Eclipse, and so it was still out on the ocean when the dolphins appeared. We got in the panga with about 8 other people and took off. We were out for about 20-30 minutes, driving right along side the dolphins while they swam along, jumping out of the water, coming within inches of the boat, doing some tricks – we've never seen anything like it. Somehow we managed to avoid getting salt water all over the camera and video camera. Some of the footage turned out, but it will probably give people sea sickness. We had dinner with Christian, the cruise director of the ship. All of the other tables were full when we got to dinner, so we sat at an empty table and he joined us. We talked about how the boat operates, what sort of clientele he normally has to deal with, problem patrons, keeping everyone happy, child rearing, pretty much everything under the sun. Christian is about 5'0, 125, and looks like he's about 18. 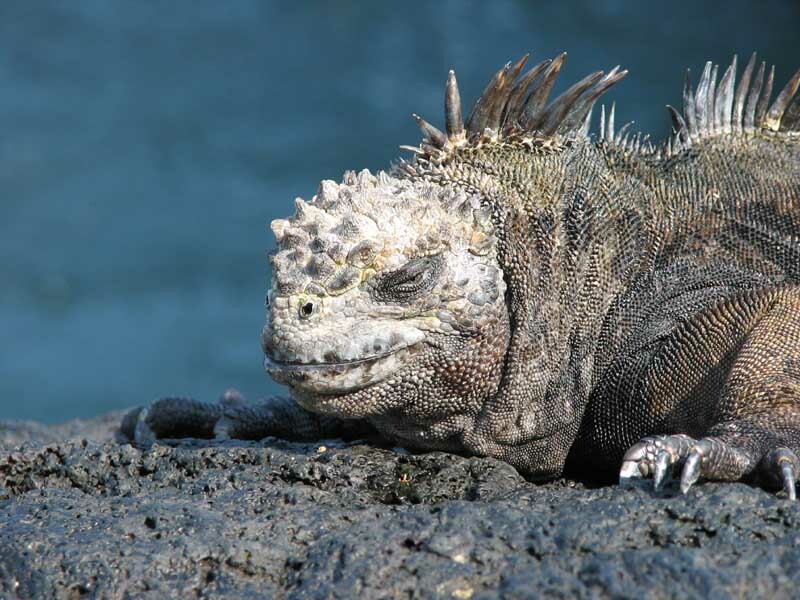 He's actually 31, and has been running boats in the Galapagos for many years. As far as we can tell, he's very good at it. After dinner, we were up on the deck checking out the ocean when we noticed a whole bunch of swallow-tailed gulls flying alongside the ship. Apparently the boat kicks up squid to the surface as it cuts through the water, and the gulls wait for a squid to appear and then dive down to get it.